UVI’s latest soft-synth resurrects a long-forgotten favourite from yesteryear. How does this recreation of the Octave Plateau Voyetra 8 stack up against the original? There are now synths for everything: new hardware analogues, digital workstations, software plug-in emulations, software that creates synths impossible in hardware, and, of course, Eurorack modules to take you on any sonic journey. Of all of these, you’d think that soft-synth emulations would have a finite life; there are only so many synths you can emulate, after all. Yet, seemingly, new ones are released all the time – the PX V8 being the latest case in point. Inevitably, though, the synths these emulations are based on become less classic and less necessary – the best ones have already been done, right? But in some cases, a new emulation is released that is a recreation of ‘the synth that got away’, a slightly hidden gem that didn’t become hugely popular at the time, nor has it yet attained classic status. It might, though, have exhibited a quirky side that gave it a narrow fanbase when released and now deserves reappraisal. PX V8 is based on the Octave Plateau Voyetra 8, a synth that might well tick some of the above boxes – so has UVI made a good decision to bring it back? 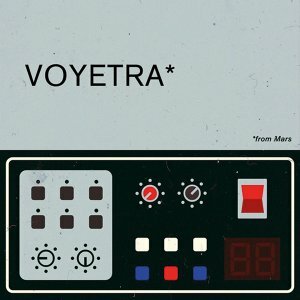 Okay, your Moogs, ARPs, Rolands, Korgs et al might have stolen the thunder in terms of sales and reputation, but the Voyetra 8 did (and does) have some pretty big fans. Perhaps the biggest of those were New Order, who used it on Blue Monday and many other big tracks. 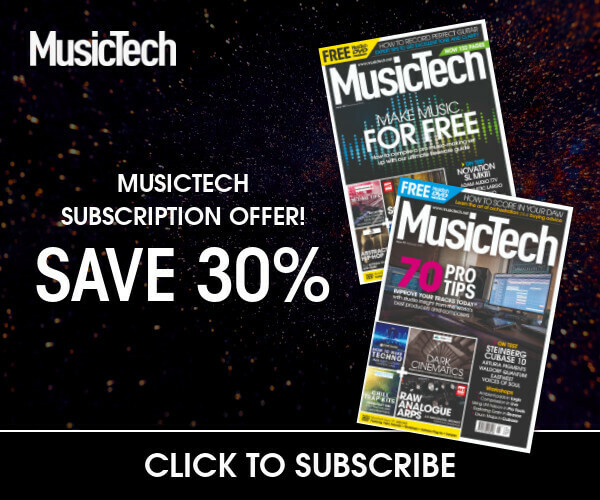 Ulrich Schnauss is also a fan – he once gave MusicTech a fabulous video tour of his studio and you can spot one towards the end, hidden in a rack. The 1982 original Voyetra was indeed a rack synth, with a separate keyboard. It was analogue and had lots of hands-on controls, 100 presets and complex modulation options. It wasn’t, apparently, the easiest synth to program, but the joys of software could well iron this out. Its sound was big and brash, characterful and, when it wanted to be, pretty complex. The developers at UVI had trouble tracking down an original unit – it took two years, and then they had a big repair job on their hands – so this instrument library has truly been a labour of love. I say ‘library’ because you’ll need either UVI’s Falcon or its (free) UVI Workstation to run it, but then it functions as a complete plug-in synth. You’ll also need to register a free iLok account, two words that usually send a shiver down my spine. Thankfully, though, after the 8GB-plus download, activation was fairly conventional, and you can run PX V8 on three different machines, should you wish, especially useful within my increasingly bloated setup. Once activated in iLok, you load up UVI Workstation and load it up either standalone or as a plug-in. I found the latter worked best; standalone, it was just a bit laggy on my setup. In Logic, however, it’s a great app, a little like Kontakt or Best Service’s Player, essentially a shell to run libraries like PX V8. You have to nudge it to show it where you have stored the download and then you load it up as a single instrument or as part of a multi-setup. Presets are laid out in folders for sound types, or as banks or more animated arpeggiated sounds. There are five main areas within PX V8 to do most of your sonic damage once you have a sound loaded in, these being Main, Edit, Mod, FX and Arp. 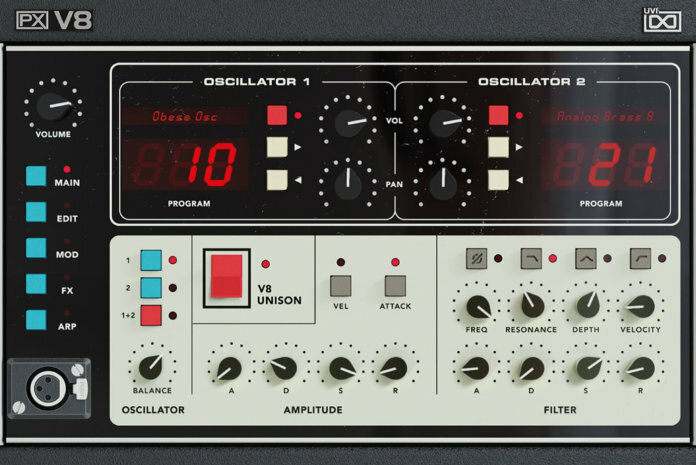 We’ll start with the Main page, where the oscillator, amplitude and filter controls reside. You get two oscillators at PX’s core, just like the original Voyetra. 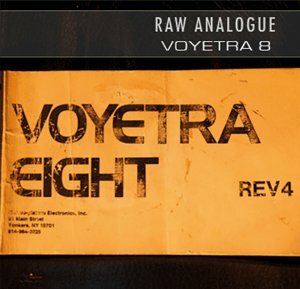 However, from the off, UVI admits that: ‘the PX V8 software does not replicate the complex architecture of the Voyetra Eight hardware’ and is really intended to give you an easier ride through that synth’s character and nature, and not to get too bogged down in the detail, a good thing in my book. So with the oscillators, for example, you can choose types based on waveforms and instrument types. Want something a bit pad-like? Load in a pad waveform on an oscillator. It’s like a way of breaking your presets down into more in-depth layers; keep everything else the same, just choose different waveforms per oscillator to change the character. One neat implementation is that the amp and filter controls on this Main screen can be applied to each individually, or both oscillators simultaneously. Next up, the Edit screen takes you to tuning and mod-wheel assignment options among others. It’s a little bit like the second half of the main synth fascia, although not like the original hardware at all. That doesn’t really matter though, as you get some decent options here. As well as quick mod-wheel assignments for vibrato, tremolo and filter, you can detune and broaden the stereo width on each or both oscillators to really spread their sound. The Modulation Page really can help you get things moving. It features both an LFO and Step Modulator. Again, the distinction between oscillators really comes to the fore, with the ability to apply modulation to both or individually. There’s probably not as much depth here as on the original (which was famed for its mod options), but there is a decent-enough amount to get filter action, LFO shaping and plenty of pitch movement going, all contributing to more dynamic sounds overall. The FX section is simply great – with easy controls, some big drama to be had and some very distinctive effects. Thorus is a simple chorus effect and Drive will give you some nice saturation; Ensemble fattens the sound up nicely, whereas both the delay and reverb add interest and a lovely broad sheen. It’s simple but very effective, and all controls are MIDI mappable for extra control. Finally, the Arp section offers some more melodic movement. Again, what is cool here is that you can apply the arpeggiator to both or individual oscillators so you can have, for example, nice lush string timbres that include a lot of movement as you play. And also like the effects and modulation sections, there are just a few controls to get your head around, but enough to create lots of drama. Overall, we’re obviously talking ‘analogue’ in terms of sound, but there’s some real beef here. There is a broad range of sounds, from real to very classic and 80s, but there are also many with new twists. 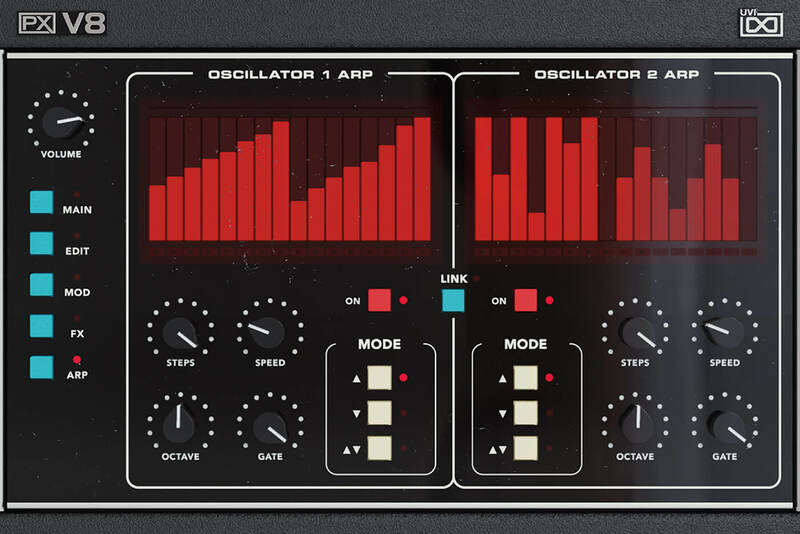 In the main, though, there is an attitude and punch; that’s partly down to the ability to apply just about everything very easily to individual oscillators or both mixed together, and it’s partly down to the ability to quickly change your source material. What also helps you stretch the sonics in both breadth and depth is the ease of use in every section. Those wanting a true Voyetra 8 – and the complexities that came with it – might have to look elsewhere, or even attempt to get the original hardware. This is more like a ‘best of’ – you get plenty of waveforms and samples as source material, and some easy controls to change them, plus lots of fun along the way doing just that and adding dynamics and great effects. You also don’t have to worry about any limitations of the original hardware, so forget any polyphonic considerations. What was already a big sound on the original can now be absolutely huge. Great value, too. If I’m completely honest, you’ll probably already have a lot of what PX V8 does in one or more of the VA-type synths that come bundled with your DAW. But there’s something big, cumbersome and beautiful about the original synth (and UVI’s re-imagining of it) that sets it apart. 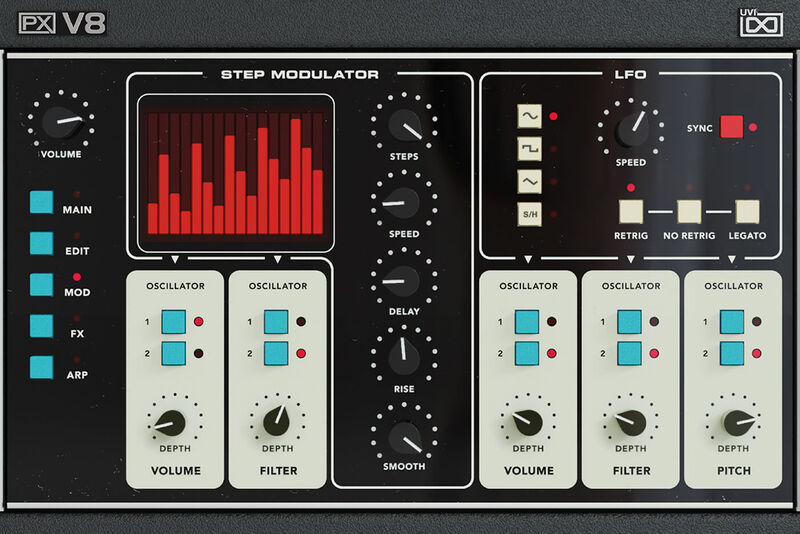 Certainly, if you want to have just about every interesting synth ever made, then this is about the best way of getting a version of Voyetra 8 that is both workable and full of attitude. This is one of the few attempts at capturing the sound and girth of an original. You get a 2.5GB sample download containing 45 multi-sampled instruments for Ableton, Kontakt, Logic and Reason. About the only other attempt we could find is another Kontakt-based sample collection, this time with over 5GB of raw material, and 35 instruments covering drums, effects, bass, chorus pads, and unison sounds. As big-sounding as the original, easy to use and doesn’t weigh 60lbs!